Rachel Gillett/Business Insider‘You could give me a million dollars, and it wouldn’t be better than one day here,’ our flight attendant says. 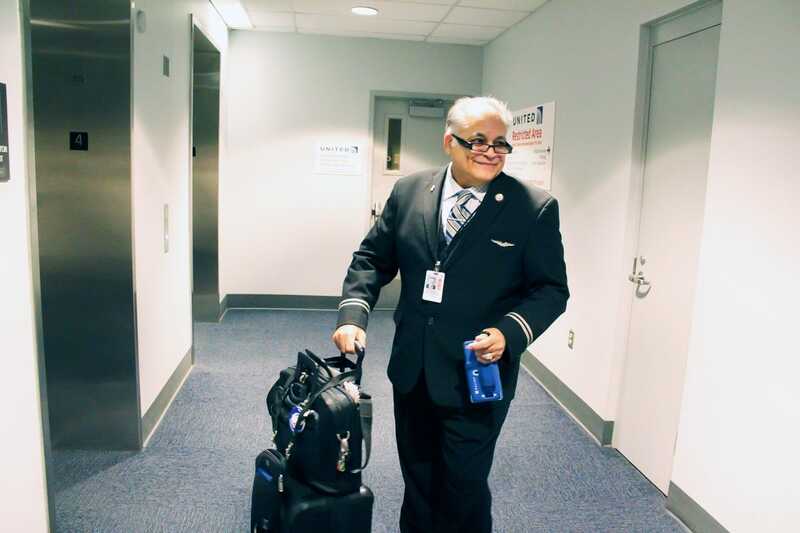 Robert “Bingo” Bingochea is a Denver-based flight attendant for United Airlines who commutes to work from his home in Phoenix. 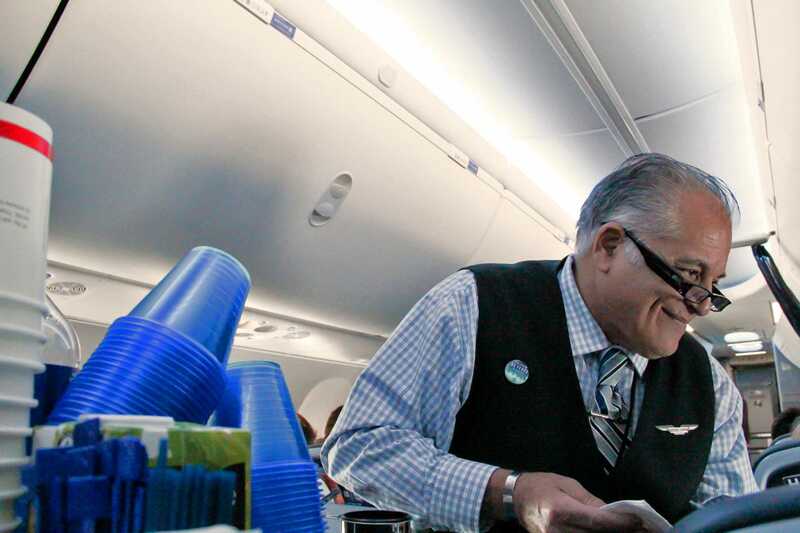 Though he says every day on the job is different, we joined him on a trip from Denver to Houston and back to capture what a day in the life of a flight attendant may look like. It’s 3 a.m., and I’m jolted awake by the ring of the hotel phone. The bright red numbers on the clock next to me are the only thing illuminating my pitch-black hotel room, and I groan as I roll over and steal another five minutes of sleep. When I checked in to the hotel at 10:30 the night before and asked for my wake-up call, the front-desk clerk was horrified to hear how little sleep I’d be getting. As it turns out, Robert “Bingo” Bingochea, a 63-year-old who has worked with United Airlines as a flight attendant for seven years, went to bed early that night, and he has already been awake for more than an hour by the time I finally bolt out of bed. He’s had his morning coffee, watched some TV news, and checked the weather from his hotel room before I even clicked the lights on in my room. He’s what you call a “commuter” in the airline industry. He’s a flight attendant based out of Denver, but he lives in Phoenix with his wife and commutes to Denver for each trip he works. Bingochea got the first flight into Denver the day before our flight, which isn’t uncommon for commuters, since flying standby means you aren’t guaranteed a seat on the flight you want, and it can sometimes take a full day to get a flight on standby. 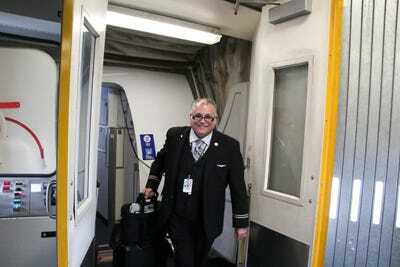 I’m shadowing him for the day, and we’re to meet at Denver International Airport to begin our journey together. 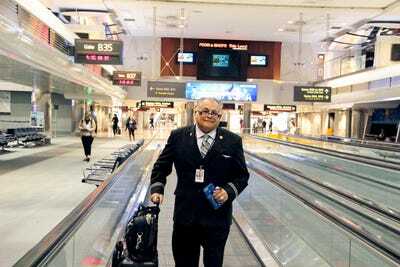 As our flight will begin boarding at 4:50 a.m., I arrive at the airport at 4 a.m. I’m scheduled to meet Bingochea at United’s In Flight area, but before that, we both need to go through airport security. Just my luck, getting through the Transportation Security Administration’s security takes me longer than anticipated. I must remove my shoes, take all electronics out of my bag, and place them, exposed, in the screening bin. 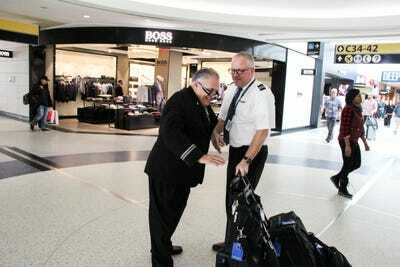 And, since I wear some medical devices, I’m treated to a full pat-down and tested for bomb residue. Bingochea, on the other hand – and other flight attendants flying through Denver International – goes through an expedited TSA screening, a process that usually takes less than a minute. 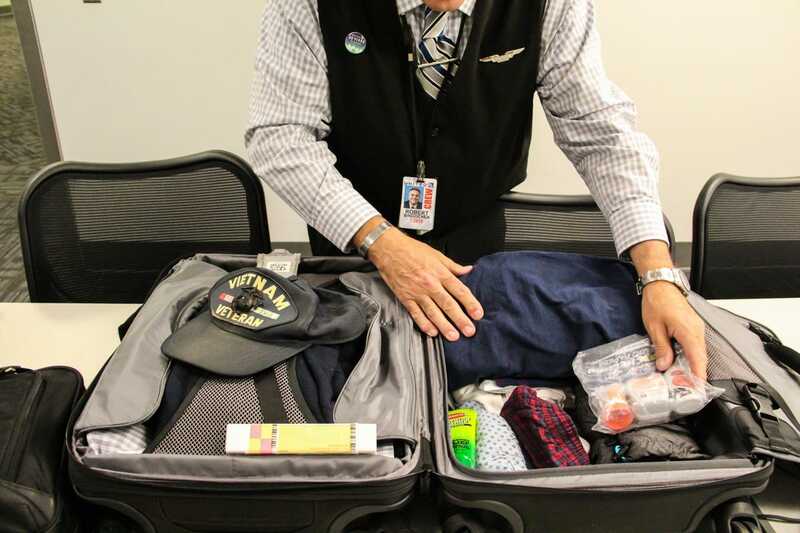 Apart from the essentials like extra underwear and T-shirts, medication, and clothing, he also takes a couple of trinkets with him: a pink, rubber frog that was his daughter’s when she was younger always goes around the world with him, as does his Vietnam Veteran cap, which commemorates his time as a medic in the US Army during the Vietnam War. In general, Bingochea doesn’t pack a lunch. He’ll bring some snacks with him, but he opts not to eat while he’s working – it makes him sluggish – and instead budgets enough money to try the different cuisines where he’s travelling. 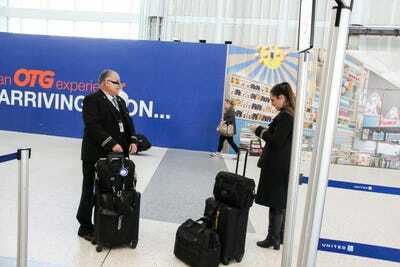 As a passenger, you won’t ever see United’s operations station. With the swipe of my handler’s United Airlines ID badge, we take an elevator up to the fourth floor, home of United’s conference rooms, HR and IT departments, and Inflight Services. … as well as with TVs showing flight times, plenty of outlets for charging phones, and a red phone for scheduling. 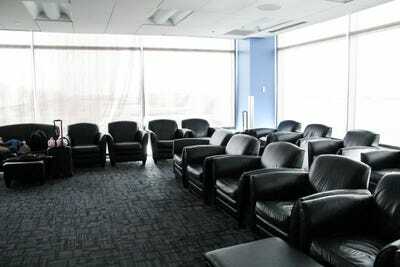 Crew members other than those on ready reserve sometimes also use the lounge and sleeping rooms. Those members include “lounge lizards,” commuters who don’t have anywhere in town to stay between trips and need a place to crash for the night. 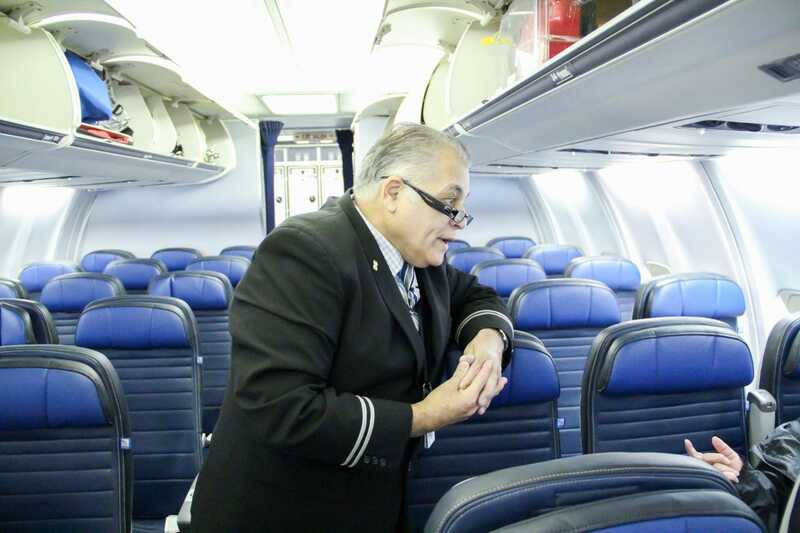 Once Bingochea and his fellow crew members have boarded the plane and stowed their baggage, it’s time for the preflight briefing. Apart from addressing logistics and procedures, the crew can also get to know one another a little better during preflight briefings, as they most likely haven’t travelled together before. 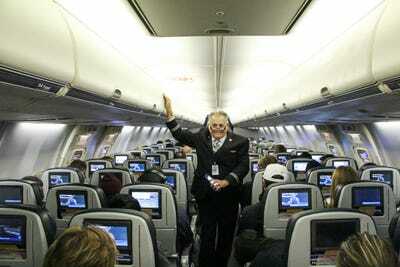 Captain Bob tells the crew that our flight will last two hours, two minutes, so we should arrive at the gate eight minutes early. 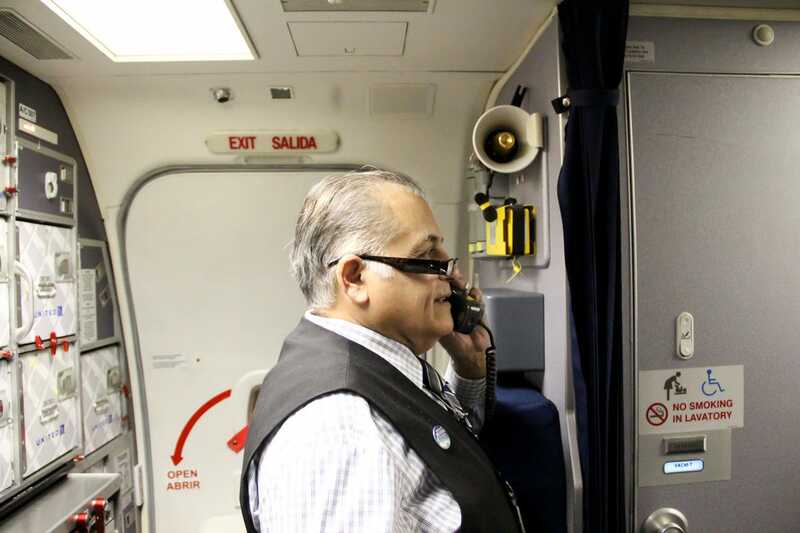 It’s standard security on this flight, so nobody “special” – meaning people like air marshals, Secret Service agents, or federal flight deck officers, who carry weapons – will be on board, and the cabin crew will have to rely on able-bodied passengers for help in an emergency. 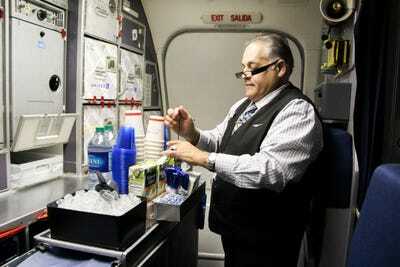 No in-flight meals will be available – just snacks for purchase and beverages. 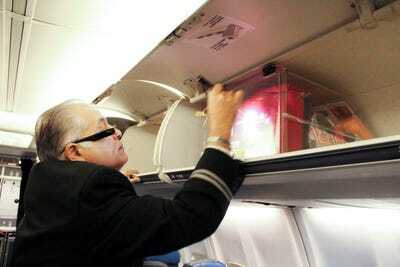 And – “thankfully” (it’s usually stressful for all involved) – no live animals will be aboard this flight. 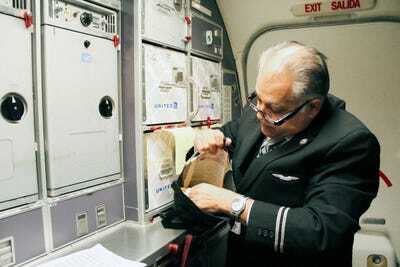 It’s time for the flight attendants to do their preflight checks at their assigned crew stations. For our almost 200-passenger flight, there are four flight attendants: two in the front of the plane and two in the back. Since Bingochea is assigned the FA01 position, he’s responsible for checking the emergency equipment at his station in the back galley, in the bathroom, and in the overhead bins at the back of the plane. Bingochea also checks the door to ensure it has sufficient pressure should we need to evacuate. 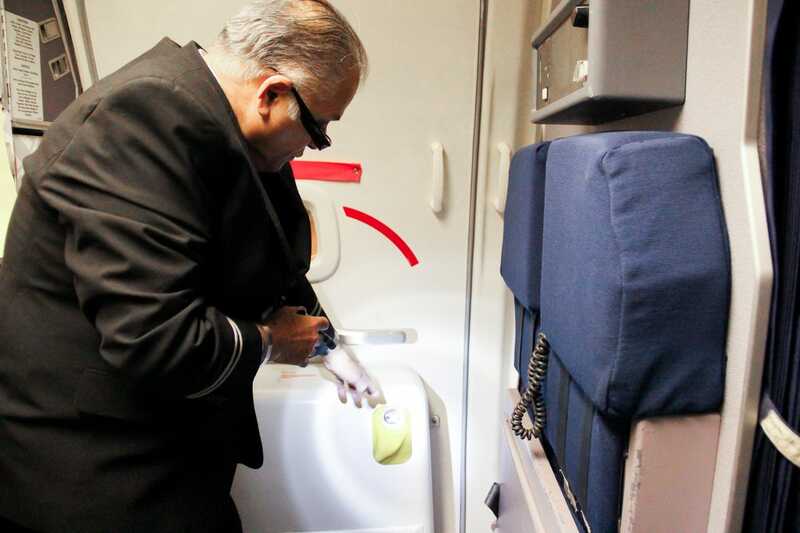 He says that, every once in a while, the Federal Aviation Administration will take something out of the aeroplane to see whether flight attendants are checking everything thoroughly. 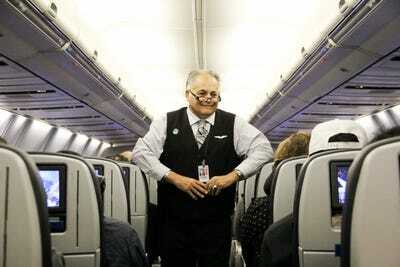 Flight attendants are trained to know every position, Bingochea says. Once you’ve achieved a certain level of seniority, you can bid for certain trips and positions — though he chooses not to. He says changing positions all the time helps keeps him on his toes, and he doesn’t have a preference for class, either. 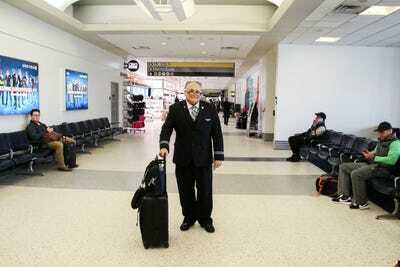 “People are people, whether they’re in first class or economy,” he says. Bingochea and his coworkers have a great deal of information for and about passengers right at their fingertips. 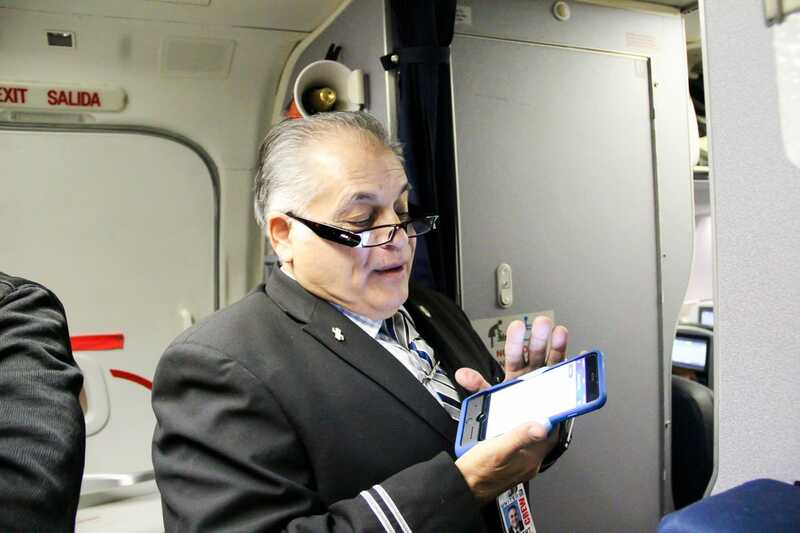 If passengers want to upgrade to “economy plus” during boarding, for example, Bingochea can accommodate the request using a proprietary app on his handheld device called Link. 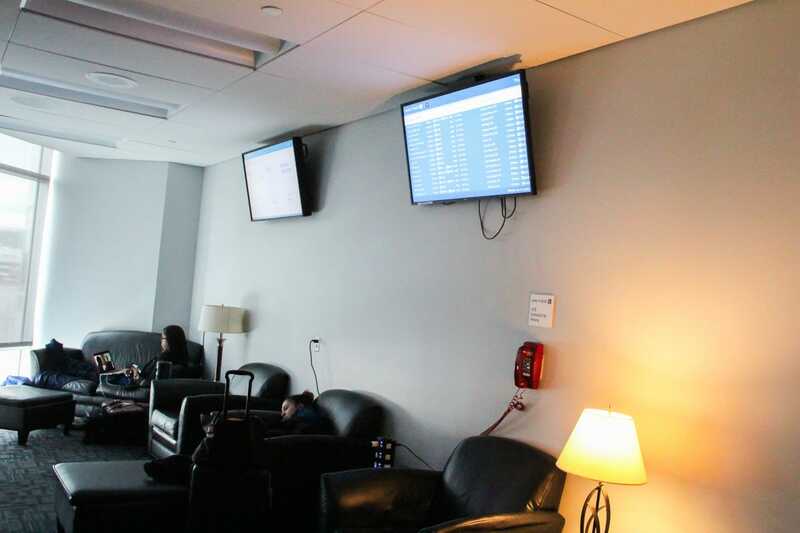 He can also use the Link app to check passengers’ reservations, including whether they have a connecting flight they need to make, as well as their flier status, and he also uses the app for food and drink sales. If something does go wrong, Bingochea says, flight attendants are empowered with resolution options, from offering a free drink or meal to updating fliers and giving them more points. “We can’t fix everything, but at least we can try to give it a chance and try to make things acceptable,” he says. 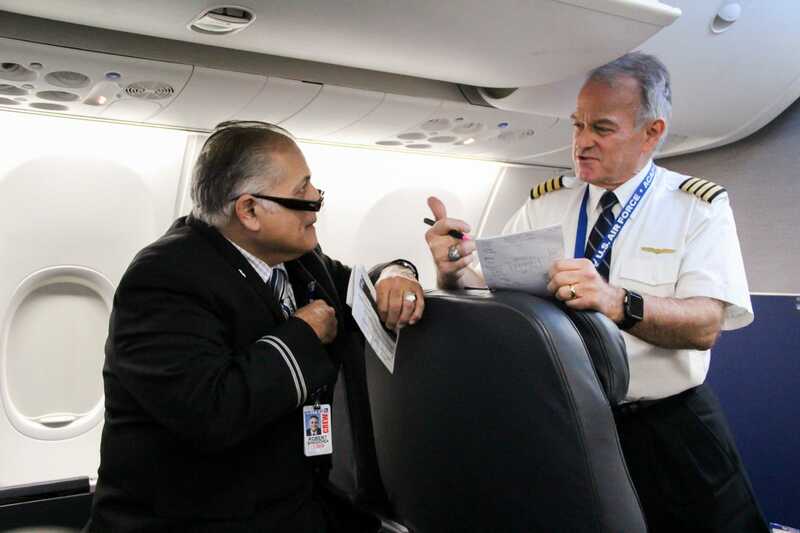 “Once the aircraft starts moving, there’s always the fear of someone falling down, and we’re in that position of liability if we don’t let the captain know,” he says. At this point, it’s time for a quick pick-me-up. 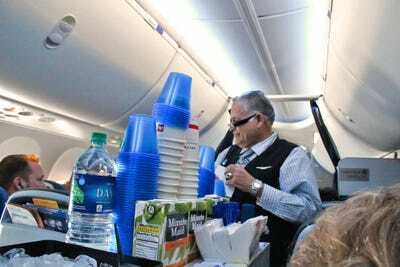 And, yes, Bingochea drinks the aeroplane coffee. During takeoff, he says, his mind goes to a different place. “You go through the different situations that can happen in your head,” he says. According to Bingochea, protocol for different emergency situations are embedded in flight attendants from day one of training so that, in an emergency, they don’t have to think about it. “It’s just there,” he says. Somehow, Bingochea and his colleagues glide up and down the aisles with ease. As I clumsily follow him around for the day, I find it almost impossible not to bump into passengers, and I bang a knee hard on an armrest at least once. As the plane levels off, Bingochea and Kristine prepare the beverage cart, shuffling around each other and the bar cart in the tiny box that is the galley. Since most passengers are sleeping, they anticipate a fairly easy service of coffee, juice, and water in no more than 20 minutes. 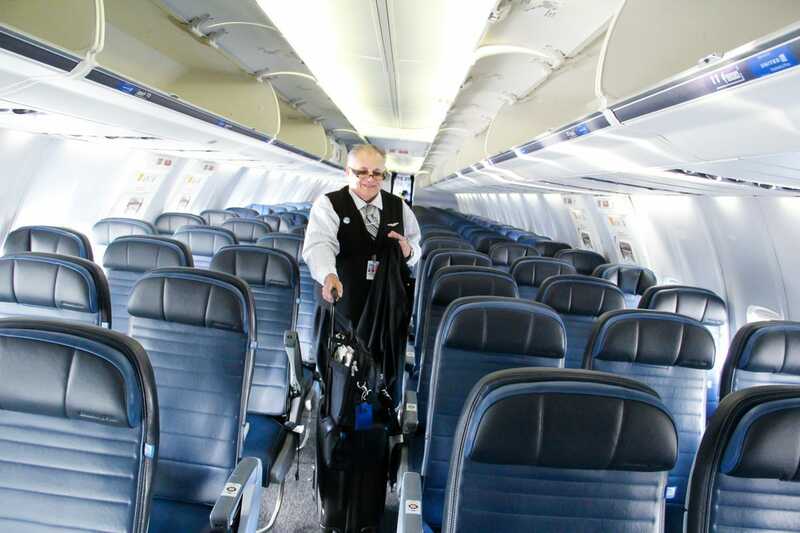 On busier daytime flights, it can take an hour to get to all the passengers. 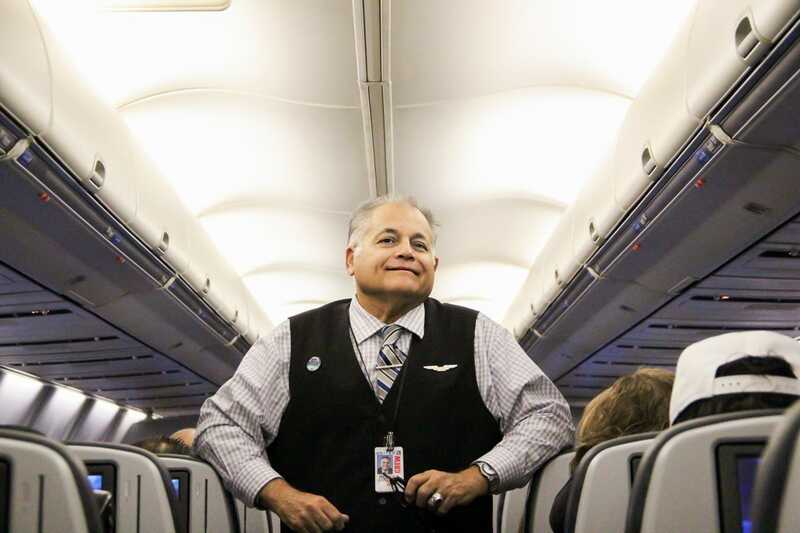 While Bingochea and I are chatting, a passenger interjects, “You’re one of the nicest flight attendants I’ve ever met.” To Bingochea, moments like these are everything. “When I hear things like that, that tells me I have a value to this company,” he says. At one point during service, Bingochea asks me how I’m feeling. “I could go another 12 hours,” he tells me. “You either want to be here or you don’t,” he responds. It’s the people, he says, who keep him going. It takes a certain kind of person to be energised by other people. They’re what you would call extroverts. It may not be a required skill for the job, but it certainly helps in Bingochea’s case. “This job will test your skills with people,” he says. “It’s not for everybody.” Even he has bad days, he acknowledges. And if you can’t manage it? 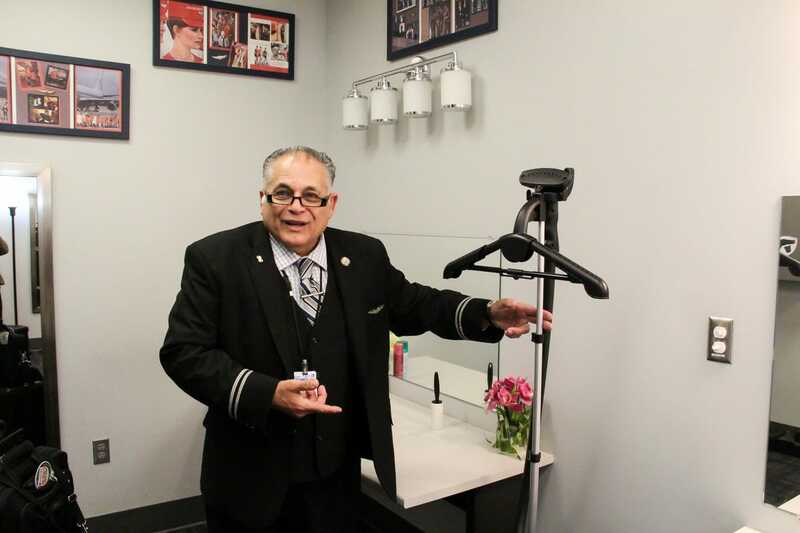 “Every time we lose somebody, there are 100 people waiting for this job,” Bingochea says. Once we’re below 10,000 feet — which is indicated with a ding everyone aboard the plane can hear — we’ve entered final descent, and everything has to be buttoned up. 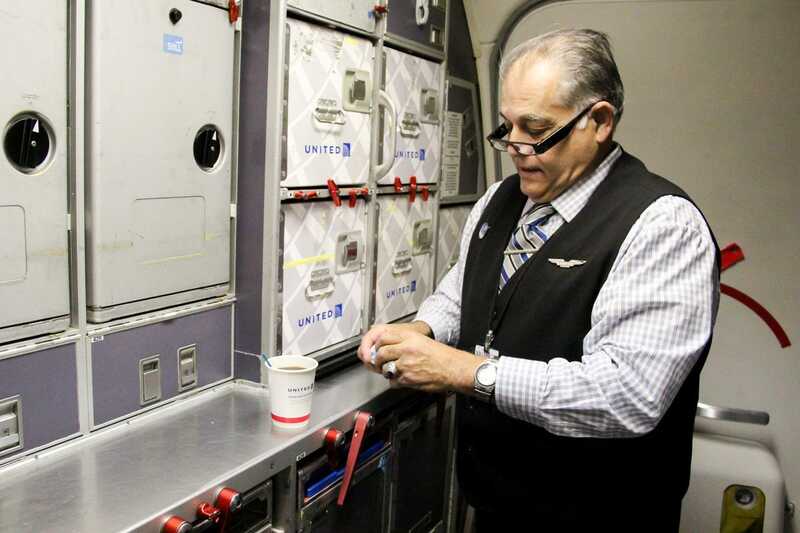 Flight attendants make sure the galley is secure, instructing passengers to put their tray table up, fasten their seat belt, and return their seats to their upright positions. “We always go through these silent drills in our mind so, should something happen, we’re ready to take on this challenge,” Bingochea says. 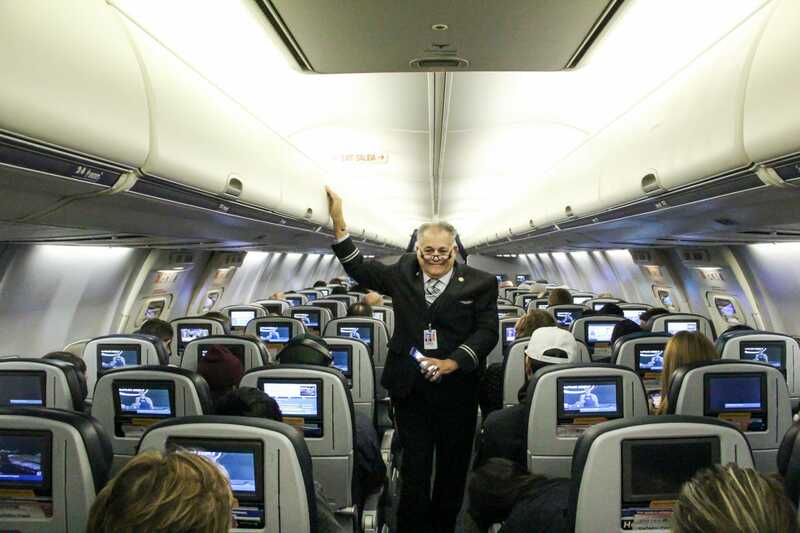 Final descent is also considered a “sterile period,” meaning the flight deck is concentrating on landing the plane, and the cabin crew is not to communicate with it during this time. 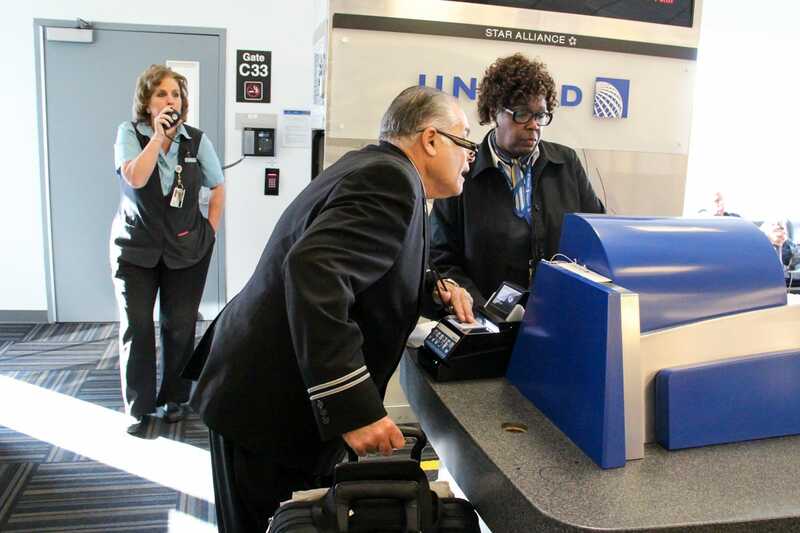 Once we land and all passengers are off the plane, it is time to head to the next gate. 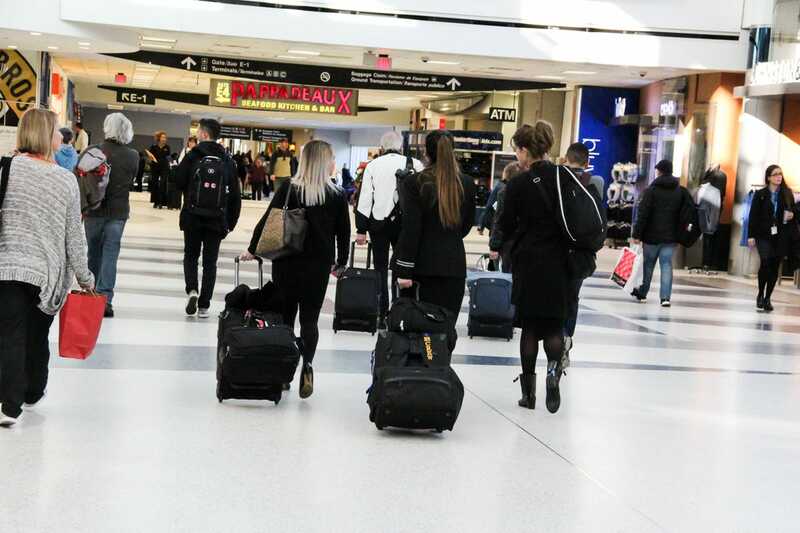 This trip is what you would call a quick turn, meaning there’s little time between arriving at the airport and heading back out to the skies. Bingochea’s crewmates sprint ahead of us so they can get to Starbucks before our next flight. 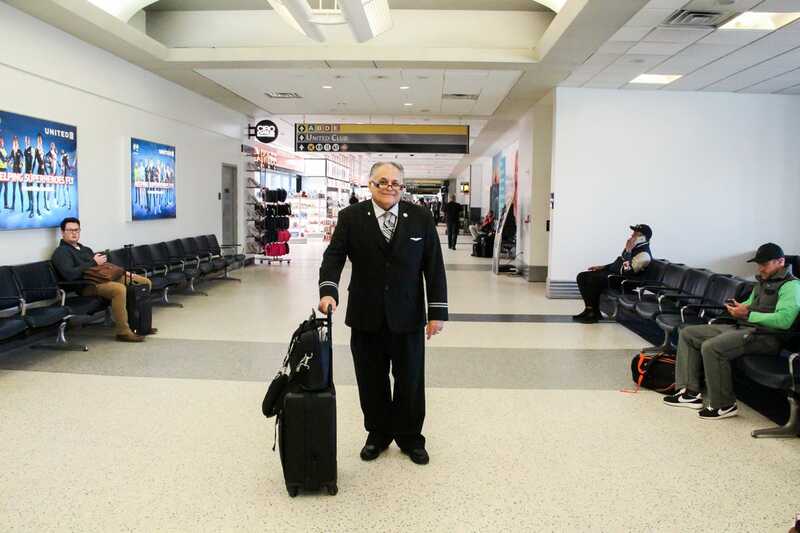 “If you’ve been through the airports enough times, you know where you have to be and how long it takes to get there,” he says. During our march through the airport, Bingochea — in full uniform — gets quite a few looks from passengers and is instantly recognised by an old friend. “This, to me, is the best part of the industry, because you have so much exposure,” he says. After less than 45 minutes in George Bush Intercontinental Airport in Houston, we board our next flight to head back to Denver on the second leg of our trip, and we do it all again. 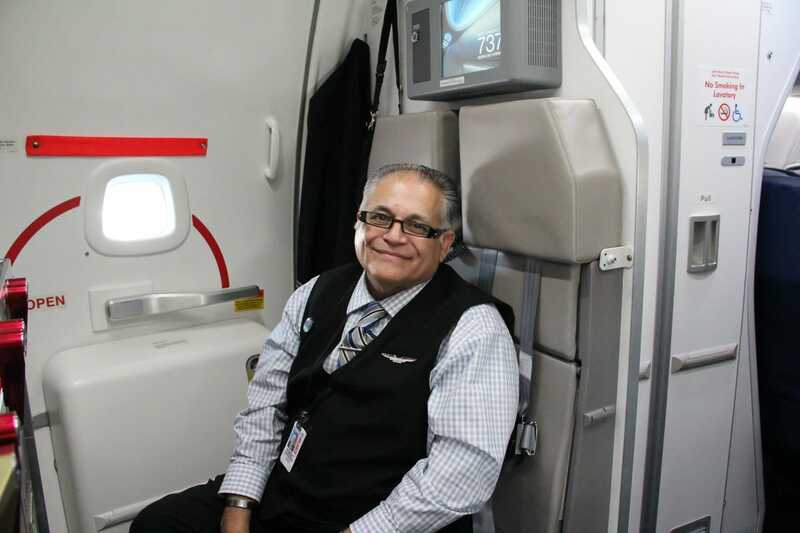 Bingochea’s shift officially ends when we deplane in Denver just before noon, but the journey’s not over for him quite yet. He manages to catch an afternoon flight home to Phoenix — another two hours away.